Longleaze Primary School is set on the northern side of Wootton Bassett near Swindon in Wiltshire. Wootton Bassett is a developing market town with a population of approximately 12,000, set in attractive countryside two miles from junction 16 of the M4. The school was opened in September 1973. The premises consist of the main block, three mobile classrooms, audio visual and music room, provided by the Longleaze School Association (L.S.A.) (for more details about the L.S.A. follow the link at the bottom of the page). September 2003 saw the opening of our impressive, new computer suite. Seventeen networked PCs offer the very latest in Educational ICT. The school also has two hard playing areas, a quiet area, grounds (including a conservation area) and a caretaker's bungalow. The Wansdyke and it's wonders - By A.B and A.M. This must be one of the most impressive parts of the Wansdyke because of it's height and width and it is the clearest part of the Wansdyke. As you can see the trees on top of the Wansdyke, would have been thorny. They would have planted these sort of trees because they would have made it harder to climb over for invaders (Celts). As you walk along you will see bits of chalk on the ground because it has been dug out by animals making their homes. The Wansdyke would of been similar to this because it too would of been chalk. There also would of been flint which are actually fossilised sponges, which came the seabed. There would have been lots of wildlife as well as badgers, hares, fallow deer, partridges, and a large flightless bird like a turkey called a bustard. Wansdyke has never been ploughed or needed by man and has always been full of wild flower. Some of them have names because they were important to the Saxons - such as milk wort, cowslips, salad Barnet, knotweed and scabious. After the Saxons, the Wansdyke was used as a drove road and where you see stinging nettles, the land is high in nitrates because of all the animal droppings. 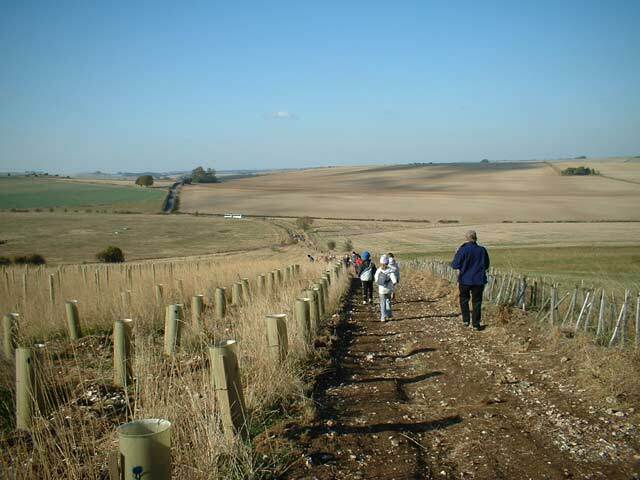 Classes 9,8 and 7 walked over the Wansdyke on 23rd October. 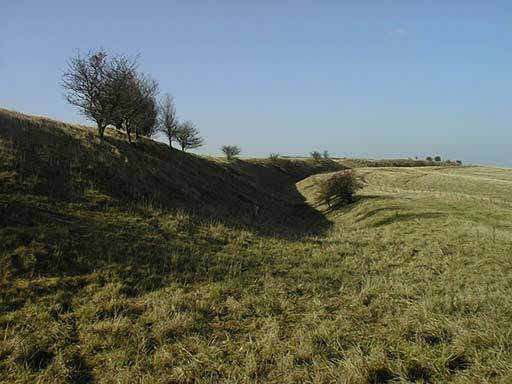 The Wansdyke is a long ditch and bank. 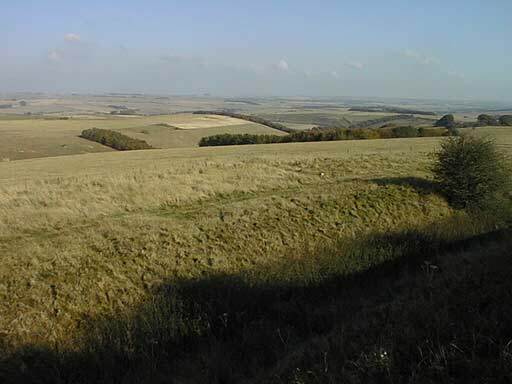 The Wansdyke is dated to the Dark Ages, roughly between 400 and 700 AD. It runs from the Avon valley south of Bristol to Savernake Forest near Marlborough in Wiltshire. The adults and children got off the coach with there wooly hats and coats and joined with their group leader. The children were walking up the hill and saw the Sarsens stones. They carried on up the hill to the Wansdyke, which years ago was covered with white chalk, but now only grass. Some people already stopped for drinks, and some people carried on walking. Around the bends the groups went until Mrs Price called us to a halt and told us to draw the Wansdyke with our clip board and pencil . After we'd finished our sketch we climbed part of the Wansdyke and had a snack. Minutes after the snacks we started to walk up and down the hill until we reached a gate which lead to a path way. Our group walked down the path way until we reached the gate where some people sat down to have a drink. Miss Price opened the gate which on the other side was a big, big field. Everyone was very excited as the groups walked through the field. When we got to the end of the field and came to a another gate. Mr Brierley opened the gate which on the other side was a main road he let the children crossed the road. Finally we found a place to eat are lunch. Then we walked through the woodlands some children skidded down a steep hill. After that we got on the coach and went back to school. On Thursday the 23rd of October we went on a school trip to learn about the Anglo Saxons and we all walked 4 miles. The spindle tree is for spinning sheep wool. The Anglo Saxons fair comes from Tan Hill and they sell clothes, jewellery, cones wooden dolls, shoes cows & Horses. The Oxen mere was to give water to cows & sheep. The Celts used the ridgeway for there side. The sarsen stones put fire under and they cracked open & there was lots of flint. We seen some horse riders & some sheep. Where did the Anglo Saxons come from? North Germany. Knap hill has got lots of sheep & they run up & down the hill really fast. Last we had our lunch. After we left school,we went on to the bus to go to the old Saxon track. We stopped to pop to the loo.Then we came back and got our bags and started the walk. It was a 4 mile walk. When we saw the spindle tree there were loads of sloths on it and there was some sheep wool on it too. The next stop was knap hill and there were lots of Sarson stones nearby. Next we got to tan hill, the Celts used the Ridgeway as a track for themselves. on a steep hill. Later on we sat down and had our lunch in shaw village. The Anglo Saxons came from North Germany. The name Wansdyke comes from the God of Wednesday called Woden. We found out that a drove road is when people drive their cows to the market to sell and a fair is when people make things out of wood and straw. Classes 7,8 and 9 went to the Wansdyke on the 23rd of October. On the way there we went past ancient stones. At the Wansdyke we saw some Sarsen stones. These were used to build both the Stonehenge and Avebury. When the Anglo-Saxons wanted to break the stones they would build a fire underneath and pour a line of cold water along the top and break it. Next to the stones was a Dew pond called Oxenmere. It is more than a thousand years old. We did a sketch of an Anglo-Saxon mound. Back in there time they built the mound to keep there enemies out of there land to steal there belongings. The spindle tree was used to tease out wool and twist it into yarn as the shepherds watched their sheep. The Wansdyke was originally a large bank with a deep ditch in front, and runs in an east-west alignment, clearly pointing to a danger from the north. What was this danger? Who were the builders? The name points to the Saxon god Woden, but that does not mean that it was pagan Anglo-Saxons who actually built it. The name might mean it was only dedicated to Woden by pagan Saxons, or that it was already forgotten who the real builders were. Archaeological research now seems to point to a construction date in the 5th century. On Thursday 23rd October we went to the Wansdyke walk. We got in the coach and drove off and went to Avebury. When we got there we started the 4 mile walk. When we got off the coach we went to see the spindle tree and it was used to tease the sheep's wool. The sarsen stones were made to be stone henges. The Tan hill was a gigantic hill that the Celts, worshiped the fire god and he had a festival in August. The Anglo Saxons came from North Germany. When we were on Knap Hill we had break there and we did some sketching. In the olden days the grass was covered in chalk. The Wansdyke was named after the godess of Wednesday and his name was Woden. These large stones are called Sarsens or troublesome stones. These stones are at Avebury and Stonehenge too. If you wanted to break these stones you would have to put a fire underneath them and then hit them hard with a hammer or something similar (sword, knife etc.). Sarsens were at the bottom of the sea so some of them have holes in them, (because Great Britain used to be under water). The reason why they have so many knife scratch marks is because the Saxons used to sharpen their weapons and knifes on them. On Thursday 23rd of October 2003 we went on the bus to the Wansdyke, class 8 and 9 came with us, it took a while to get there but we did in the end. We came to a spindle tree, our leader said that the Anglo Saxons used the twigs on the tree to tease the wool from the sheep; they chose the spindle tree because of its strong branches. After the spindle tree we saw some big grey stones. The stones are called Sarsen stones the Anglo Saxons used them for building, they could be broken if you got them hot, and pour water over the stones. The first hill we came upon was called Knap hill and we did some sketching of the view, then we had our snack. Next we saw a little dip. The dip was called Oxen mere, years ago it had lots of water in it, do you know where oxen mere got its name from? Well it got its name from all the ox that used to drink from it. Next we came to Tan hill the Saxons had festivals there every August to worship the god of the sun. Then we saw the Ridge Way were the Celts used to live, do you know what is the difference between the Ridge Way and the Wansdyke? The difference is the Celts went on the Ridge Way, and not the Wansdyke. When we reached the hill top we all stopped and sat down to draw a picture. We had are lunch at 1.30 then we saw a dew pond a man made it to stop walking up and down with buckets of water, it was filled with nettles. Wansdyke means Woden's Dyke after a god that both Saxon and Vikings belived in. The ridge was dug out of chalk and so it would originally have been much higher with a deeper ditch and shining white after the Saxon, the Wansdyke was used as a drove road and where you see the nettles, the land is high in nitrates. The day we went to Wansdyke the weather was sunny with a cold wind. 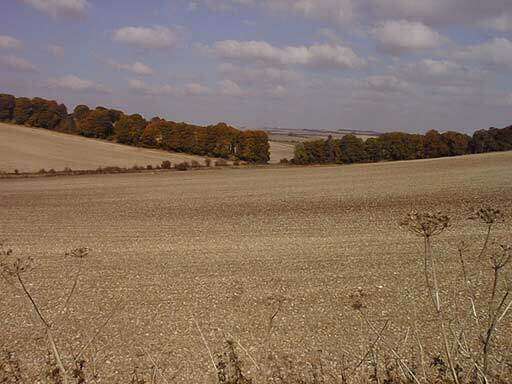 The Wansdyke is a long ditch and bank, also known as a linear defensive earthwork. It runs from the Avon valley south of Bristol to Savernake Forest near Marlborough in Wiltshire. 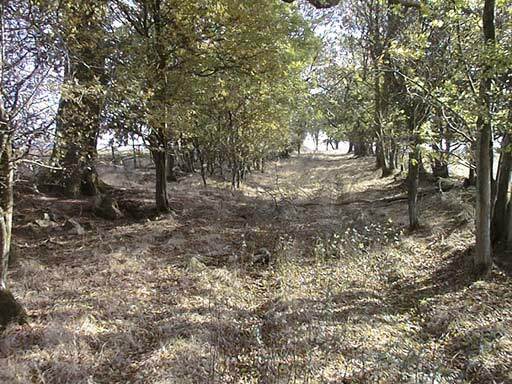 The Wansdyke was originally a large bank with a deep ditch in front. When we got to the Wansdyke we were split in to groups and started off on our four mile walk. We walked up a hill and saw some sheep on the hill side and the sarcen stones. When we got there we started our 4 mile walk along the path and up the hill. There were lots of sheep on the way they ran away when they saw us coming. We walk in a lot of sheep poo. On our way walking up the hill we saw some Sarsen stones. Sarsen stone was used to make fires. The Wansdyke was a ditch and bank which was used to of the invaders from Scotland. Everybody saw a dew pond that is called Oxenmere it was filled with nettles.The dew pond is man made over thousand years old built so that stock could drink. Wansdyke means wooden's dyke. Some of us saw a lot of flint stone and chalk. We stood on on the hill and we could see everything. By the time we got up the hill we were puffed out so that's why the Saxons built a high hill so when the invaders got up they were to tired to fight. After that we drew a sketch of Wansdyke. Once we had finished the sketches we went up the hill to have lunch. When everybody finished there lunch we walked to the coach and went back to school and went home. When we got there Mr Brierley sorted out our groups. After that we headed off to the hill where we had to cross the road. When we where at the bottom of the hill we saw an old pond with stinging nettles in it as the animals left droppings there along time ago and sarsens stone round it, no water as it has been dried up. We started climbing the hill. Half way up the hill we saw a lot of sheep. When we got to the top of the hill everyone was tired so we sat down and sketched a part of the Wansdyke. Everybody walked a long a part of the Wansdyke and had a snack on it. Then we had to come down to get on track to the coaches. All of us walked through a lot of fields before we stopped for lunch and played . Everybody ran down a big hill and into the woods. There was a lot of logs to climb over or under and there were tracks in the ground. There was a lot of steep hills to climb up and hills run down. There was loads of bogey puddles in the woods. There was a big hill to run down to get to the coaches. When we were on the coach we were tired as we walked a long way. 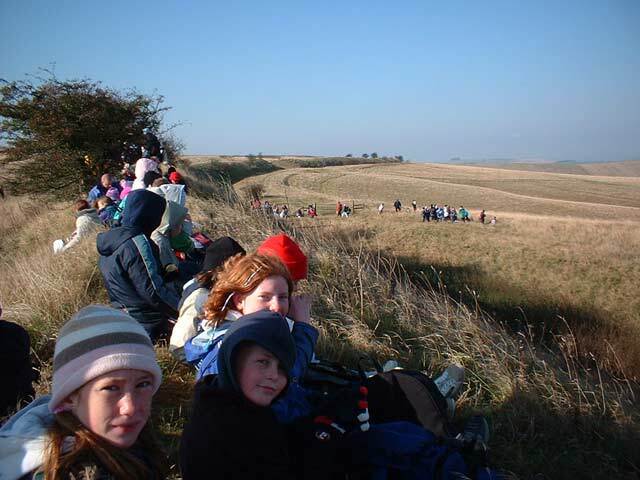 On Thursday the 23rd October 2003 Class 7 went to the Wansdyke walk. When we got out of the bus we sorted out our groups. The first thing we saw was the spindle tree. It was used for making coats and other clothing. Next we walked up a big hill but there was not much there. After we had climbed the hill we went on the rocks. Then we walked a bit more, we drew pictures at the top of the hill and had our snack. The hill was called Knap Hill. We found a place called Oxen mere where oxen drink. After we had our snack we walked across the hill. Next we went to look at some flint. Then we went into the forest to have our lunch. We walked down a big hill and we saw the bus. The Bus took us back to school. The name Wansdyke came from the god of Wednesday called Woden. The Saxons came from Northern Germany. There was a drove rode where the Saxons used to drive there cattle to market and fairs to sell. On the way back we saw some Sarsen stones. What did we do at the Wansdyke Walk? On Thursday 23rd October we went on the Wansdyke walk, the coach took 20 minutes. First we saw a spindle tree, it was used to spin some sheep wool. Second we saw some Sarson Stones, they were used to built Avebury and Stonehenge. Oxen Mere was for cattle to drink from. Tan Hill is were the Celts worship their Sun God. In August they had a big festival. We had our break on Knap Hill. At Ridgeway it was used for Celts road from Wiltshire to East England. Celts out}. Drove Road means Saxons drove oxen to markets and farms. On Thursday 23rd October class 7, 8 and 9 went on a school trip. The children were in groups and travelled from School on the coach. The trip involved doing a 4 mile walk across the Wansdyke. We started the walk and saw a spindle tree, the hard straight twigs were used to make a spindle so the shepherds could twist the wool into yarn. We saw lots of sheep in the fields like it would have been in the Anglo Saxon times. We stopped to have our mid morning snack close to the settlement and then we did some sketching. We continued walking and saw some jet black horses. Whilst we were still walking a rabbit ran across Mrs Riley's Mrs Galt's and Miss Price's feet, it scared them. We went to the Wansdyke on Thursday. It was very educational. We walked 4 miles in the coldness and some of us weren't very happy about it. The first thing we saw were spindle trees and we use them for making spindles. Then we saw Sarsen stones they were used for Stone Henge and Avebury, you can brake them if you put them over a fire pore cold water on. After that we saw an old dew pond what animals used to drink out of. Farmers made it because it stopped them having to go back and forth carrying heavy buckets of water. Wansdyke is a long ditch and bank. 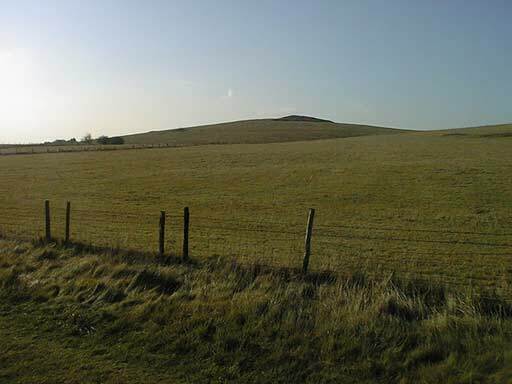 The Wansdyke is dated to the Dark Ages, roughly between 400 and 700 AD. It runs from the Avon valley south of Bristol to Savernake Forest near Marlborough in Wiltshire. 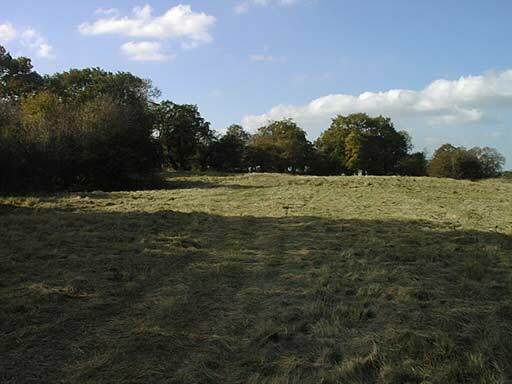 Wansdyke was originally a large bank with a deep ditch in front. The Wansdyke was used to keep there enemies out. We went on the hills of the Wansdyke and no wonder they built it that high because you could see for miles, and you would know when your enemies are coming. Wansdyke means Woden's dyke named after the god that both Saxon's and Viking's believed in.He was god of war so the Saxon's put a stop to war until some one silly declared war, and the peace was broken. We get Wednesday from his name. The Wansdyke keeps going east and then ends up coming to a junction that crosses with a ridge way. We also walked up on an ancient hill top track way and had our morning snack. 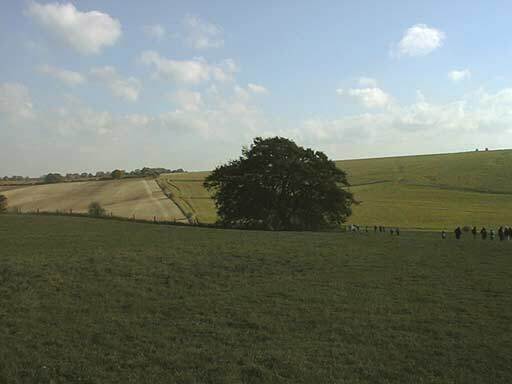 On Thursday 23rd October 2003 we went on a Wansdyke walk, an Anglo Saxon walk which is in Avebury near Devizes, we went 4 miles. This is what we have found out. The Anglo Saxons used spindle trees to get sheep's wool off the sheep. Then we saw some sarsen stones, sarsen stones were made for building things like we have bricks for houses. Then we walked past some sheep, by the sheep was a pond, the Anglo Saxon built it so that the animals could drink out of it. The Ridge way was the celts and the Wansdyke was a white dyke. The Anglo Saxons came from northern Germany. 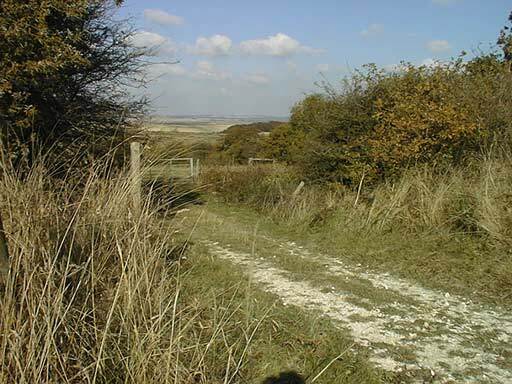 Wansdyke was made from chalk and flint to scare the Celts away. Knap Hill was the Anglo Saxon's look out. A drove road is when they make a herd of animals (usually cows) to a different place (like Tan hill). Tan hill is were people sell animals usually cow's, horses, sheep and sheep's wool. The name Wansdyke comes from the god of Wednesday. We enjoyed the Wansdyke walk it was fun we especially liked the forest. 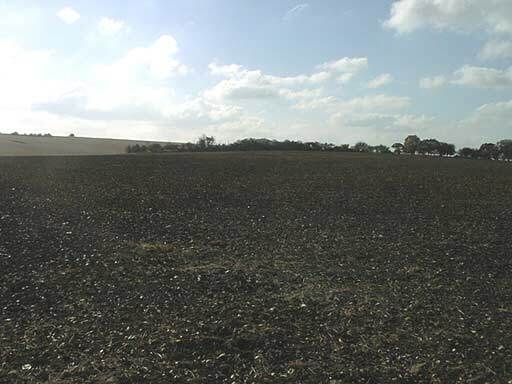 This is a beautiful view of the Wiltshire plains, there is lots of sharp flint here. In Anglo Saxon times the hard flint was used to make sharp tools or weapons, the Anglo Saxons claimed all the white land theirs. There is lots of chalk here, there are loads of animals and burrows where you can easily trip over. The spindle tree was grow in sheep rearing country because of its hard straight twigs, which could be used to make a spindle so that shepherds could tease out wool and twist it into there yarn as they watch there sheep. When we got there we started walking up a hill and saw a lot of Sarsen stones. There were a lot of stinging nettles which was a sign of animal droppings. We carried on walking and saw a lot sheep eating and running away from us. Everyone walked on and got to the actual Wansdyke where we stopped and sketched part of it. Everyone went up to the top of the Wansdyke and had our morning snack. We carried on walking along the top of it and then came back down of it. Everybody walked on and came to loads of hills and came to a dew pond were animals and people would drink. Soon we saw loads of signs of animals like rabbit holes, deer footprints and bird feathers. Everyone stopped for lunch and then set of again then the teachers told us we could run down the big hill. When we got to the top of the big hill we went through this forest. We walked four miles and were very tired but it was still the best trip ever!!!!!!!!!!!!!!!!!!!!!!!!!!!!!! Wansdyke is a long ditch and bank they made it to keep out there enemies from the north known as the Celts. It is dated to the Dark Ages, roughly between 400 and 700 AD. The Wansdyke means Wodens dyke after a god that the Saxons and the Vikings worshipped he was the god of war. The Wansdyke when the Saxons were around would have been made out of white chalk. Wansdyke walk - By Mitchell and Scott T.
On Thursday 23rd October 2003 classes 7, 8 and 9 went on a school trip called the Wansdyke Walk. We were on the bus on the way to the Wansdyke Walk, we stopped off at Avebury for a toilet break. We got back on the bus, after 5 or 10 minutes we were there. We got off the bus again, got into our groups and walked to our first stop the Spindle tree. The Spindle tree sticks was used by shepherds to spin the sheep's wool into yarn, for their cloaks. The sarsens stones are in Avebury where we stopped off to go to the toilet. The oxen mere was a place where oxen used to drink out of, that is how it got it's name. On knap hill we had our snack, we also drew a sketch of Wansdyke, we could also see Silvery hill. 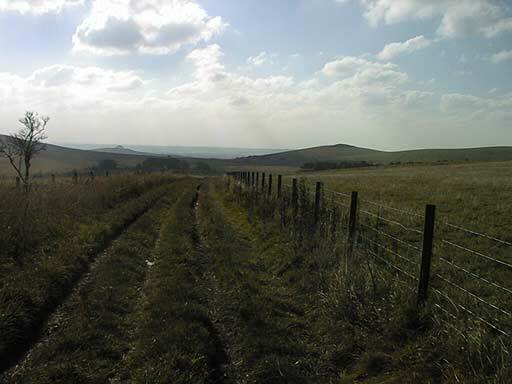 The Ridge way track is where the Celts used to walk and the Wansdyke meets up with the Ridge way. The Celts where scared of the dyke. At the fair on Tan hill they sold cattle, wooden dolls, wooden carved plates, sheep, hair clips, hair combs, shoes, clothes, wooden blocks for chalk, chalk and straw hats. Shaw village is where we stopped to have our lunch then a bit of playtime. It was like a curve in the ground. The Wansdyke got it's name from the god Woden. The Wansdyke was a walk way which went from Bath to Marlborough. This is where we drew are sketches of the Wansdyke. The Wansdyke when it was first made was much deeper and completely white. The Wansdyke was a border between the Saxons and the Celts, it would of had spiky tree's and bushes on top to make it harder for the Celts to get through. Class 7,8,9 from Longleaze visit the Wansdyke. It was a long journey there in the coach. Before we arrived there we went to the toilet at Avebury. When we got there everyone got into groups. Class 9 started off first then class 8 and then class 7 started off last. It was at least 4 miles long. We found a bunch of rocks/sarsens we believed dated back to the Anglo Saxon time. The dew pond was full of stinging nettles, it was used for collecting water from rain to use less water. Next we went to the top of the hill there was a big mound and we did a sketch of the Wansdyke. We had our snack and we carried on the hill then we went over a style. They used the Wansdyke to frighten their enemies away. Everyone found a tree to stretch wool. There was a hole in the hill that had chalk that Anglo Saxons use. Some of us were digging for chalk. Many of us have evidence that sheep were around in Anglo Saxon time. After we ran down the hill and we waited for our leaders and all of us crossed the road. Some people ran up a steep hill. Quickly we jogged across a field, style, field, style and another two fields. Slowly after we had lunch then we ran down a hill and then up a hill. Next we sprinted through a forest up a hill. Slowly we ran down a fun steep hill and got on the coach. While all of us were going back to school I was sleeping. When we got there Mr Brierley sorted us in to our groups. Everyone walked up a big hill we stopped and looked at some Sarsen stones. Once we got to the top of the hill we sketched the Wansdyke. After that we sat on top of the Wansdyke and had our snack. Most of us walked beside the Wansdyke through fields we stopped to make sure everyone was with us. All of us were having races down this big field. We had to stop at the bottom because we had to cross a road we walked up another field we spotted an x marked on the field that we just walked down. There was a style that we had to climb over, we walked through another field. Next we had to climb over an other style which was a bit hard to climb over because it hard barb wire. Afterwards we had our lunch and had 5 minutes play time we had races up a hill. We got back in to our groups and went in to the wood there was another stile that we had to climb over. A tree had fallen in the way of the path so we had to go under it. We got out of the wood and walked to the coach. The Wansdyke is named after the Saxon god called Woden. In Saxon times the Wansdyke would have been white colour because it was made out of chalk. On Thursday October 23th we went on the coach it took a few minutes we stopped to go to the loo. Then we went to the Wansdyke and we had to sketch the Wansdyke . After that we went to have our lunch. On the hills was a lot of Spindle trees then we had another break and after that then we had our proper lunch. Next we went into the forest but before we knew it the coaches were there at the bottom of the hill, going back we all charged down the hill. Then we went back to school and we sat on the carpet and talked about the journey and the Carson stones is were they worshiped to their Gods. The Wansdyke itself - By S.B. and H.S. We were sitting on the most impressive part of the Wansdyke (that is left). It is the most impressive part because most of the Wansdyke has eroded away. Wansdyke is named after the Saxon and Viking god of war, Woden`s Dyke. We get Wednesday from his name. While we walked along this part we saw animal burrows filled with chalk and flint. We couldn't see the chalk because grass has grown over it. In the middle of the dew pond there was lots of stinging nettles which was a sign of animal droppings. There were also lots of Sarsen stones. The Wansdyke is a long ditch and bank Wansdyke is dated to the Dark Ages, roughly between 400 and 700 A.D. it is one of the largest linear earthworks in the UK.We walked more and then we started to sketch the Wansdyke from a gap in the Wansdyke. The gaps in the Wansdyke were used for looking through them to see if an enemy was coming. After we got of the coach we got sorted into groups .Then all of us walked up a stoney path which was used to lead Anglo Saxon animals. At the end of the path there was a big dried out dew pond that would save the farmers from carrying heavy buckets of water back and forth every 5 minutes. First we went on a coach and stopped at Avebury. We got back on the coach and we were on our way to Devizes. When we got there, there was a pond that was empty that was the Oxen Mere, for Oxen's. They were a kind of cow with horns but a bit bigger. The Sarsen Stones were big stones built in Avebury Stone Henge. We saw the Ridgeway, it was an ancient track where the Celts lived. On Knap hill, we saw millions of sheep, they were running away as we walked by. Lunch was around the corner from Shaw village. Where did they come from? The Anglo Saxons came from North Germany. Silbury Hill is the biggest hill in England. Tan Hill is where the people worshiped there god's and we ran up it. We walked with Mrs. Galt. We had a very nice time. When we got there we got into our groups and of we went. First we went the Sarson stones and there were stinging nettles, in the pond but there wasn't any water. There was lots of animal dropping on the grass. After we went down a hill and then we stopped to sketch the Wansdyke. All of us went up a hill and then we had a snack. We went down a path and stopped to have a rest and then we went of again to the road and we crossed over and we climbed up a massive hill with sheep on we had to climb over a fence and then we ran all the way to a another fence. Then we went along a path to the the place we had lunch. After we had a little play and then we ran down a big hill and ran up a bigger hill and some of us saw a rabbit. Next we went into a wood and there was lots of puddles and when we came out we could see the coaches we walked to the coach and we had a rest on the way down then we got on the coach. Altogether it was four miles long. The Wansdyke is named after a Saxon and Viking god called Woden. The Wansdyke would be white in the Saxon times because of the chalk. There was lots of flint on the Wansdyke. There were gaps in the Wansdyke. When we got there we got into our groups and of we went. First we went the Sarson stones and there were stinging nettles, in the pond but there wasn't any water. There was lots of animal dropping on the grass. After we went down a hill and then we stopped to sketch the Wansdyke. All of us went up a hill and then we had a snack. We went down a path and stopped to have a rest and then we went of again to the road and we crossed over and we climbed up a massive hill with sheep on we had to climb over a fence and then we ran all the way to a another fence. Then we went along a path to the the place we had lunch. After we had a little play and then we ran down a big hill and ran up a bigger hill and some of us saw a rabbit. Next we went into a wood and there was lots of puddles and when we came out we could see the coaches we walked to the coach and we had a rest on the way down then we got on the coach. Altogether it was four miles long. The Wansdyke is named after a Saxon and Viking god called Woden. The Wansdyke would be white in the Saxon times because of the chalk. There was lots of flint on the Wansdyke. There were gaps in the Wansdyke. Our Class got to the Wansdyke we all got into groups we started to walk. We saw rocks and we also saw spindle trees. Our group had only walked half a mile our feet were quite sore. When we were walking we saw lots of sheep. This has always been sheep countries, the sheep would of been in flocks with a shepherd. Would of dressed in sheep skin properly a long cloak and carry a crook. Over to the left is a dew pond called Oxenmere is a man made pond more than a thousand years old. And we saw some of their fluff on the ground everyone was trying to catch up with Miss Prices class. Our group walked up to the Ridgeway and it still uses the Saxon's name. Classes 7,8 and 9 hike the Wansdyke. Now research now seems to point to a construction date in the 5th century. 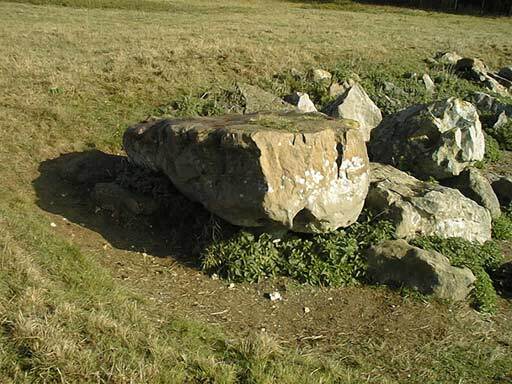 Sarsen stone are found at the Wansdyke and cuts from there also use to build Avebury. The Wansdyke is a long ditch and bank, also known as a linear defensive earthwork.is dated to the Dark Ages, roughly between 400 and 700 AD. It runs from the Avon valley south of Bristol to Savernake Forest near Marlborough in Wiltshire. It is one of the largest linear earthworks in the UK. It was originally a large bank with a deep ditch in front. On the 23rd of October 2003 we went On a school trip and First we went on a bus to the walk, then we stopped at Avebury to go to the toilet, when we got off the bus we saw a spindle tree and the farmer used the sharp twigs for the sheep wool. Nap hill was the next stop. The oxen mere was a ditch in the ground so the Animals can drink the water out of it. We had a snack at Nap hill we did a sketch there as well. The Ridgeway was where the Clts used a track. The Anglo Saxons have a fair in August. It is the biggest feast in the world and they sell; Animals, jumpers, pans, pots, cups, knifes, forks, spoons, hair slides, hair bobbeles, pencils and teeth. Tan hill is a rocky hill and we were running up it but we werent atully aloud and we all turned around and saw an x cropped on the Farmers field. Silbury hill is the biggest hill in England. It is in Avbury. This part of the Wansdyke is the part that would keep the enemies out. It was white to show that it was someone else's land. This is one of the best parts of the Wansdyke left. 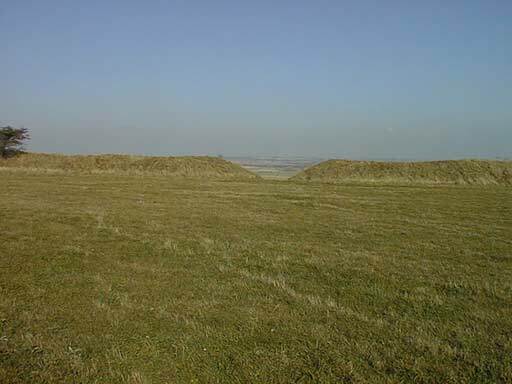 The Wansdyke was used in Anglo Saxon times to separate the Saxons and the Celts. The Wansdyke was named after a Saxon god called Woden that's why it was called Woden's dyke. The Wansdyke had spiky trees on the top of it so that they can keep the Celts out. Wansdyke going east soon comes to a junction with the Ridgeway. This is a ancient hill top track way from Norfolk to Wiltshire and probably on to the Dorset Coast. It follows the high ground and is wide and so it was often the path that the armies and Warrior Bands took. 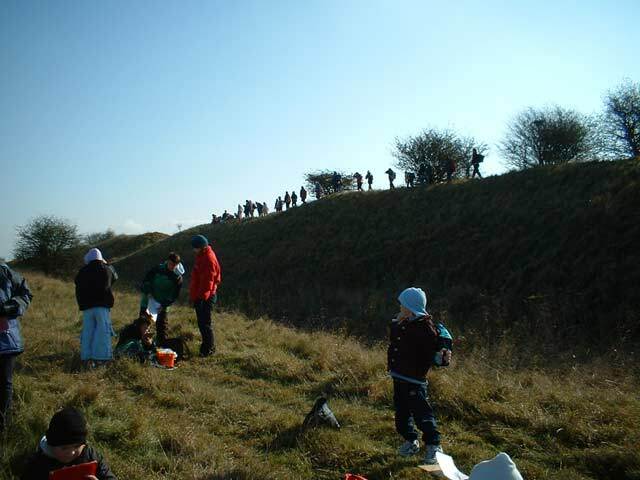 Class 7,8 and 9 went to the Wansdyke on 21st October 2003. 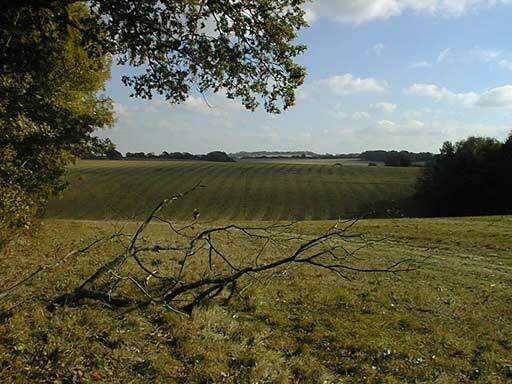 The Wansdyke is found in the middle of beautiful country side with lovely landscapes. It is a very old historical site believed to have been built by the Anglo Saxons. It was white when it was first built to frighten off their enemies. A gap in the Wans Dyke helped the Anglo Saxon to check if the enemy was coming. 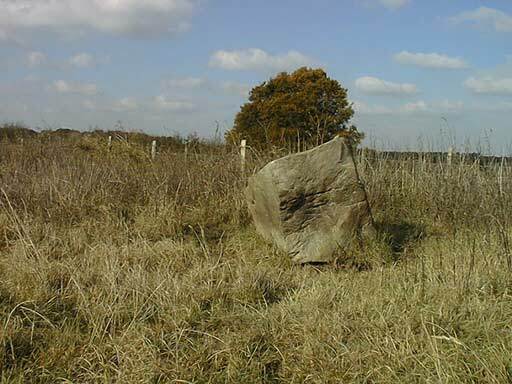 Sarsen stones are found at the Wansdyke. 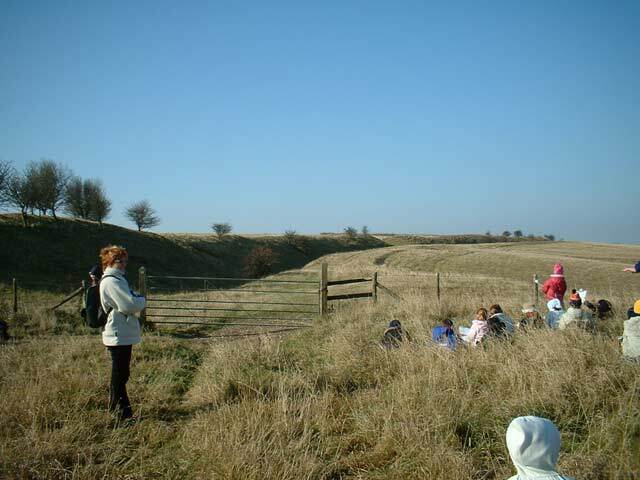 When we arrived at the Wansdyke our class split up into groups, and got a sheet about the Wansdyke. While classes 7,8 and 9 walked across the Wansdyke, adults pointed out the scenery such as: the Sarsen stones, a dew pond called Oxenmere where animals throughout Anglo Saxon times drank from,there were also stinging nettles in the old pond, and spindle trees for keeping enemies out their land. The classes had to draw a sketch of the Wansdyke for their art. After we did our sketches all the classes walked up the hill where Anglo Saxons used to spy on their enemies. Then our group spotted some rabbits. We saw sheep wool which the Saxons used for clothes. All the classes saw the Ridge, which would of originally been white in Anglo Saxon times. We walked on a drove road where Anglo Saxons would of taken their cattle. The classes saw the gaps in the Wansdyke. Our group found some fossils while we were walking up the hill. Copyright � 2003, Longleaze Primary School. All rights reserved. Used with permission. This is a picture that has a lot of flint. The Anglo Saxons used flint to make fire amongst other things. Class 9 took some flint home with them! In the picture you can see trees, what the shepherds used to use for shelter to keep them warm when they were looking after their flock.If it was really cold they would go to the flint field and get some flint to make a fire. Flint field - By G.D. and J.W. This is a picture of one of the fossilised sponge fields. In Anglo Saxons time they would of had flint fields too. This is the biggest flint field on the walk. Shaw village once had a Saxon church, a smithy and a main street. It was possibly a garrison village for the Wansdyke. It might have preceded the Eald Burgh (where you started to walk along the Wansdyke). It as always been very remote and in 1377, only 3 people living there paid any tax. The flattened fields - By S.B. and H.S. The fields that you can see have tried to be flattened by the Anglo Saxons, Anglo Saxons thought that if they flattened the fields it will be easier to farm. The tree in this picture is known to have sarsens underneath it. The field leading to Shaw Village - By J.A.C.C. All that is left of the Wansdyke here is the line of oak trees at the back.This has happened because of the erosion over the years it's been there. Can you see the 2 lines on the path that class 9 are walking on? It is a flint path.The path is in a field where farmers have tried to flatten their land because it is hard to farm on a hill. This has ended up with some of the hill flat and some of it sloped. The Wansdyke had many hills which made it very easy for the Saxons to see the enemy. The Wansdyke was also there so the enemy like the Celts could not invade. The Wansdyke had holes in the dyke so they can fire arrows out at their enemies. Many of us walked though fields like this on our trip. It was a very long walk but we still enjoyed even know it was very far. Lots of us got a lot of exercise and we got to see a lot of sheep and diffrent wildlife. Our group leader was very nice on the trip and we all had a good laugh. Many of us saw many stones called sarsen stones and they were around lots of stinging nettles in a big round circle that used to be a pond. The stones you see in the field are called Sarsens or 'troublesome stones'. Here is one in the pictures. They were used to build both Stonehenge and Avebury. If people wanted to break them up they would build a fire underneath them. When the sandstone was very hot they would pour cold water on them and then they would break. 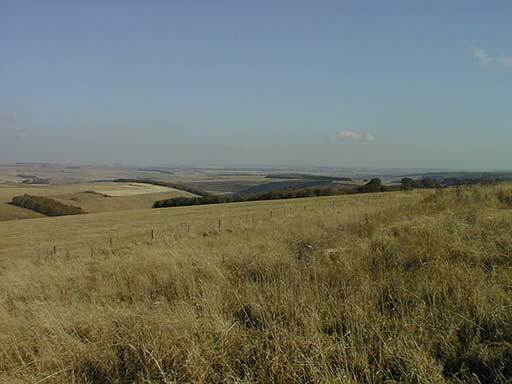 The Ridge way and Plains of Wiltshire - By A.B & A.A. 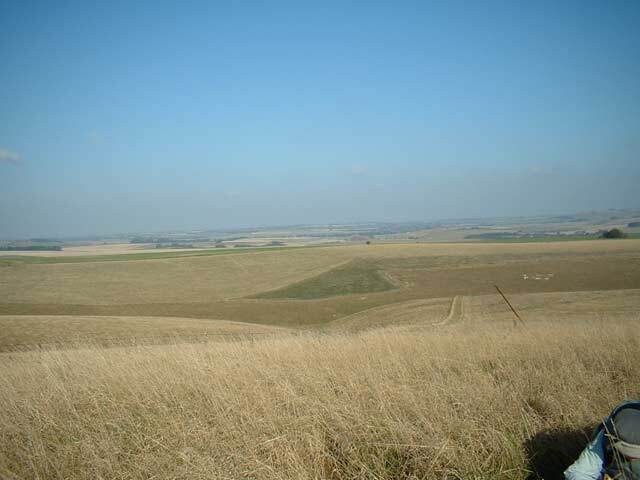 This is part of the view from the top of the Wansdyke itself, though slightly to the right. This is what Wiltshire is all about all, it's open fields and not a house in sight (but maybe the odd farmhouse). The Wansdyke would of originally been taller and wider. If you look at the trees in the middle of the picture you might not see it but that is where the Ridge way is. This an ancient hill top track way, from Norfolk to Wiltshire and probably onto the Dorset coast. It follows the high ground and is wide and so it was often the path that armies and warrior bands took. To the south, on Milk Hill, were fought two battles - The battle of Wodensbury in 592 and the battle of Adam's Grave in 715. (Adam's Grave is a long barrow similar to West Kennet).Vikings would of also used the Ridge way. The Wansdyke - By C.H. and I.S. This is what Wiltshire is all about - open fields and hill tops. We went on a school trip to The Wansdyke, this is where we sat down to do our sketches of the Wansdyke. If you looked carefully you could see the fields behind the Wansdyke. Behind this is another hill called Silbury Hill. The gaps in the Wansdyke are called shaws through the shaw we are looking at you can see Silbury Hill and the beautiful country side. There is a shaw half a mile down the path and it is called Red Shaw. Iron ore (like rust) was found here and this was used to mark sheep so everyone knew who they belonged to. The gap in the Wansdyke is called Shaw. The Shaw we are looking at you can see Silbury hill though it and the beautiful country side. There is a Shaw one mile down the path and it is called red shore. There was iron ore just like rust. It was found here and it was used to mark sheep so the shepherd knew who they belonged too. The name Red Shore comes from the Ruddle man who was red due to the iron ore he sold. The people were afraid of him and thought he was the devil. Iron ore is used for marking sheep so that shepherds would know whose sheep were whose. People were afraid of the ruddle man because he was often seen in red (because of the ore). In the Anglo-Saxon times, there would have been lots of wildlife on top of the Wansdyke, such as badgers, hares, partridges, fallow deer, and flight-less birds like turkeys called bustards. Wansdyke is named after the Saxon God of war, Woden, to become Wodensdyke.The fourth day of the week, Wednesday comes from the name Woden. The Saxons thought Woden was the ancestor of their kings. This is the actual Wansdyke. This is a picture of when Class 9 were doing their sketches of the Wansdyke. Wansdyke - By A.N And A.T. This picture shows Class 9 walking alongside the Wansdyke. This part of the Wansdyke has been eroded away. The Wansdyke has been eroded away because its thousands and thousands years old, and its eroded away because of all the people that have walked on it through time. The Wansdyke protected the Anglo Saxons in a fight because it was all covered in white chalk and it had prickle and thorn bushes on top of it to scare away all the enemies. The Wansdyke is covered in grass now. The highest hill, to the West is called Tan Hill meaning fire of Sun, and it may be a place where the Celts worshiped the God of Fire. Every year for more than a 1000 years a great fair would have been held there on 6th/7th of August. The last one was held in 1932. They would of had more than 20,000 sheep there as well as oxen and horses. The animals would have been held in pens made of hazel hurdles and these would have been kept in a shelter up here. Everything else would of been brought up and in the days beforehand, hundreds of people and thousands of sheep would make their way from every direction. Wansdyke where the road runs through it. This is the wood that we walked through. At The Beginning Of West woods. This is a big field where we had our lunch. On the left was the Wansdyke but it was not particularly impressive as it was overgrown and covered with trees. You can see in front of you the start of West Woods which we walked through and some of us saw some pheasants. As we walked up the hill it lead into the entrance of West Wood and the end of a very long relaxing walk. This is the Wiltshire Plains where our teacher stopped us and said this is what Wiltshire is really about - big open fields with very few people living there. This is the road and fields going down to the coaches. In the Saxon times there would have been just open fields and no farm land. This is also where we came out of West Woods where we saw some pheasants. On the path was flint which was used for tools and weapons in the Saxon times. This is when we walked back to the bus.